Touch is a primary reinforcer, and one of the foundations of emotion and motivation . Touch associated with positive affect is rewarding, i.e., individuals approach for it, and experience it as pleasant. In contrast, touch associated with negative affect is punishing, i.e., individuals avoid or escape from it, and experience it as unpleasant. Inter-individual touch is frequently used to communicate positive messages, such as reassurance, comfort, sympathy, and support . Touch from another person can be soothing [3,4], give rise to pleasurable feelings [5,6], and potentially suppress pain and negative emotion [7-10]. Skin-to-skin contact between individuals also has a pivotal role in social interactions, sub serving nonverbal communication of intentions and affect. A romantic caress is a primary expression of affiliative behavior that reflects the disposition of individuals to seek close contact with each other, promoting socio-emotional relationships, pair bonding, and reproduction [11-13]. Therefore, touch is a primary reinforcer strongly connected with motivational and affective processes that may drive social behavior . Clinically, massage therapy is often used as an adjunct treatment for various conditions, including those involving chronic pain and distress [15-17]. Furthermore, it can enhance growth and cognitive functioning in preterm infants [18,19] and preschoolers . Moreover, massage has beneficial effects in cancer patients by modulating immunity, alleviating depressive symptoms , and lessening pain and sleep disturbances [22-24]. Soft touch/stroking, including massage therapy, is characterized by gentle touches of the skin involving light pressure effleurage and calm stroking movements intended to increase the recipient’s well-being , pleasure , and relaxation [27,28]. Therefore, understanding the influence of physical parameters including the softness, temperature, force, velocity, and movement patterns, is important to clarify their effects and underlying neural mechanisms. As the human hand is intrinsically soft and warm, softness and temperature may remain within a certain limited range. In addition, force and velocity may also remain within a specific range with the intention to increase the recipient’s well-being, pleasure, and relaxation. In contrast, movement patterns (e.g., how to move one’s own hand over the back of the recipient’s hand) are varied; circular movements may make individuals feel natural and comfortable, while mechanical movements may make them to feel unnatural and uncomfortable. Accordingly, even a subtle difference in the movement pattern may cause unexpected emotions. Based on these considerations, it is important to clarify the relationships between movement patterns and emotions, and the underlying neural mechanisms. However, such neuroscientific studies have not yet been performed. The emotional aspects of touch have been explained as positive feelings elicited by activating specific C-tactile (CT) afferents in the skin that signal to areas in the brain involved in positive emotions . Processing of body signals occurs via unmyelinated or thinly myelinated afferents, via interoceptive pathways that signal feelings rather than sensing states, as well as controlling organ functions that do not reach conscious perception. Stroking with a soft brush on hairy skin activates the contralateral posterior insular cortex, as well as the primary somatosensory cortex (SI). The insular cortex is a region of great interest in relation to affective mechanisms, and is considered as a gateway from sensory systems to the emotional systems of the frontal lobe [30,31]. The medial prefrontal cortex (mPFC)/anterior cingulate cortex (ACC) are also implicated in processing CT-targeted touch . In addition, CTs are tuned to respond to tactile stimuli with the specific thermal characteristics of a gentle caress delivered at normal skin temperature . Therefore, this reinforces their role in providing a peripheral mechanism to signal pleasant skinto- skin contact in humans, thereby promoting interpersonal touch and affiliative behavior. Moreover, an important neural mechanism exists that is known to exert top-down regulation of ascending somatosensory information. Placeboinduced enhancement of pleasant experiences involves upregulation of activity in the posterior insula and SI . In contrast, placebo-induced analgesia involves downregulation of activity in these areas [35-37]. These results indicate that increased early sensory processing of a stimulus of positive valence (e.g., pleasant touch) underpins hyperhedonia, in a similar manner to which reduced processing of an aversive stimulus (e.g., painful touch) underpins analgesia . Placebo-induced improvement of positive and negative hedonic feelings is underpinned by recruitment of common circuitry associated with emotion appraisal. This includes placebo-induced functional coupling between the ventromedial prefrontal cortex (vmPFC) and periaqueductal gray (PAG), which is correlated with increased sensory responses to stroking touch but decreased responses to painful touch . Thus, similar modulatory circuits can either up- or down-regulate early sensory processing depending on whether the expectation is enhancement of positive or negative hedonic feelings. The PAG–rostral ventromedial medulla (RVM)–spinal cord axis is important for many forms of pro- and anti-nociception in nonhuman animals, paralleling involvement in human placebo and nocebo effects [38,39]. This axis is, in turn, governed by the ACC, vmPFC and mid-lateral orbitofrontal cortex (OFC) [36,40-45], which interact with the PAG–RVM pathway to mediate various pain-modulatory effects as part of the descending pain modulatory system (DPMS) . The above neural mechanisms have been investigated by using highly unpleasant tactile stimuli such as those associated with pain, and by using top-down cognitive effects. Thus, whether similar neural mechanisms are activated with mild tactile stimulation such as affiliative and gentle touch remains unconfirmed. A recent fMRI study has shown that there is intrinsic functional connectivity in the DPMS in non-painful situations , and another one has shown that self-touch activates the DPMS in a pain-free and stress-free situation . These studies may support the possibility that the DPMS regulates somatosensory afferents based on their emotive valence, even for mild somatosensory stimuli with subtly different movement patterns. Based on these considerations, we focused in the current study on two basic movements: circular movement and back-and-forth movement. These movements are fundamental components constituting diverse movement patterns. Circular movement is associated with human and affiliative characteristics that would induce positive feelings, such as gentle, safe, and warm feelings. In contrast, back-and-forth movement has non-human and mechanical characteristics, which would make participants feel unnatural and nervous. We investigated differences in the activity of certain brain regions including the SI, cerebellum (CB), OFC, ACC, insula, and PAG. We conducted analyses to test our hypothesis that the DPMS regulates mild somatosensory afferent signals. We also hypothesized that the OFC activity would be associated with natural and positive emotions induced by circular rubbing, while the ACC activity would be associated with unnatural and nervous feelings induced by back-and-forth rubbing. We recruited 12 healthy female participants (mean age: 31.5 ± 3.7 years). All participants were right-handed according to the Chapman test (13.3 ± 0.6) and had no history of neurological or psychiatric disorders. Participants provided informed consent to participate in the study. The Research Ethics Committee of Tokyo Metropolitan University approved this study and all methods were performed in accordance with approved guidelines. Each participant was instructed to relax and close her eyes without thinking about anything specific. We set two experimental conditions, in which one of the authors (TI) who is a professional esthetician, rubbed the back of the participant’s hand in a circular motion (C) or rubbed it using a back-and-forth motion (BF). She practiced the rubbing so that she could rub the participant’s hand with a maximum force of less than 0.3 N, and velocities between 6 cm/sec and 10 cm/sec. Within this range, CT-fibers respond optimally to stimulation [33,48,49], and parents naturally stroke their babies . A session consisted of 8 trials (2 conditions × 4 times), with the trials counterbalanced across participants. A blockdesign paradigm was applied, with each trial lasting 32 sec interspersed with rest for 8 sec. After the fMRI scans, participants were asked to rate their emotional state while being touched by TI in the same way during the fMRI experiment. We administered nine items to measure subjective feelings: ‘‘To what extent did you feel gentle (“gentle”), safe (“safe”), warm (“warm”), comfortable (“comfortable”), preferable (“preferable”), calm (“calm”), unnatural (“unnatural”), nervous (“nervous”), or unpleasant (“unpleasant”)?’’. We used visual analog scaling for data collection (0%-100%). In addition, they were required to rate the perceived intensity on a fivepoint scale (1 = very weak, 2 = moderately weak, 3 = neutral, 4 = moderately strong, 5 = very strong). Statistical analyses were conducted with SPSS version 21.0 (SPSS, Inc., Chicago, IL). Scanning was conducted with a 3.0T MRI system (Achieva Quasar Dual, Philips). BOLD T2*-weighted MR signals were measured with a gradient echo-planar imaging (EPI) sequence (TR = 4,000 msec, TE = 35 msec, flip angle = 90°, FOV = 23 cm2, scan matrix = 128 × 128, total scan time = 324 sec, slice thickness = 5 mm, 25 slices per volume). Image processing was conducted with Statistical Parametric Mapping 8 (SPM8, Welcome Department of Imaging Neuroscience, London, UK; http://www.fil.ion.ucl.ac.uk/spm/software/spm8). EPI images were realigned and normalized to Montreal Neurological Institute (MNI) stereotactic space. Normalized images were smoothed with an 8 mm fullwidth half-maximum Gaussian kernel. The data were temporally convolved with the hemodynamic response function (HRF) and high-pass filtered with a cutoff period of 128 sec. Each C and BF condition was modeled with a separate regressor. We set spherical regions of interest (ROI) in the right SI (40 -31 59) , left CB (-36 -61 -29) , left mid-lateral OFC (-24 36 -18) , right ACC (11 52 15) , right posterior insula (42 -31 21) , PAG (-6 -33 -18) , and RVM (-2 -38 -38) . ROIs with a radius of 5 mm were set for each contrasts of C vs. baseline and BF vs. baseline. Subsequently, we tested differences in the eigenvariate values for each ROI between C and BF by using a paired t-test (P<0.05). Furthermore, we conducted multiple regression analyses with each eigenvariate value for ROIs in the right SI, mid-lateral OFC, and ACC as dependent variable and those of the other ROIs as the independent variables (P<0.05). Multiple regression analyses were conducted for both C vs. baseline and BF vs. baseline. Moreover, we checked the residuals by performing the Shapiro- Wilks (S-W) test of normality (P<0.05), and calculated the Durbin-Watson (D-W) statistic for the null hypothesis of no autocorrelation. We conducted multiple regression analyses with each eigenvariate value for the ROIs as the dependent variable and subjective feelings as the independent variables (P<0.05). Moreover, we checked the residuals by performing the S-W test of normality (P<0.05), and calculated the D-W statistic for the null hypothesis of no autocorrelation. We performed a principal component analysis (PCA) to classify all the ROIs into subgroups by using the Varimax rotation method with Kaiser Normalization. In addition, we checked the sampling adequacy by using Bartlett’s test of sphericity and the Kaiser-Meyer-Olkin (KMO) test. We also performed multiple regression analyses with scores of each principal component as the dependent variable, and the subjective rating scores as independent variables (P<0.05). We then checked the residuals for all regression analyses by performing the S-W test of normality (P<0.05), and calculated the D-W statistic for the null hypothesis of no autocorrelation. Furthermore, to confirm whether simultaneous activation of the RVM and deactivation of the PAG is positively correlated with right SI activity, we performed PCA and calculated the principal component scores for the simultaneous reverse activity and a simple regression analysis between the scores and right SI activity (P<0.05). In addition, we checked the sampling adequacy by using Bartlett’s test of sphericity and the Kaiser-Meyer-Olkin test, the residuals for all regression analyses by performing the S-W test of normality (P<0.05), and calculated the D-W statistic for the null hypothesis of no autocorrelation. These statistical analyses were conducted with SPSS version 21.0. Participants showed significantly higher scores for “gentle”, “safe”, “warm”, “comfortable”, “preferable”, and “calm” in C compared with BF. 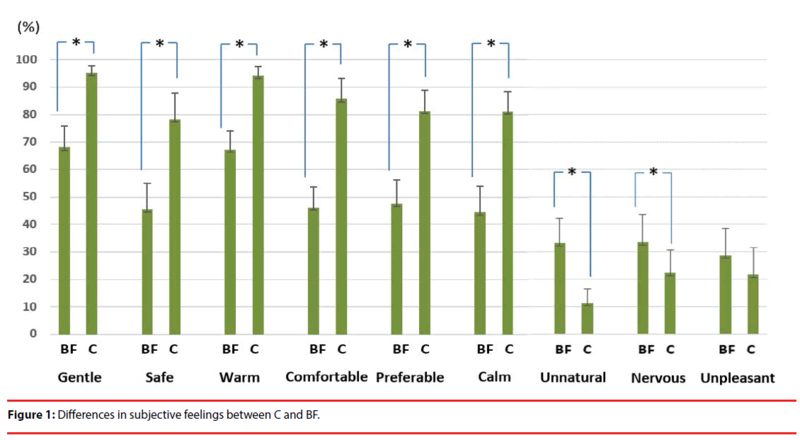 In contrast, they showed significantly higher scores for “unnatural” and “nervous” in BF compared with C. There was no significant difference in “unpleasant” feeling (Figure 1). Moreover, there was also no significant difference in the perceived intensity by Wilcoxon signedrank test at P<0.05 (C 2.833 ± 0.697; BF 2.833 ± 0.333). Figure 1: Differences in subjective feelings between C and BF. The right SI (t=3.077, P=0.011) and left CB (t=3.587, P=0.004) showed significantly higher activity in C compared with BF. In contrast, the ACC (t=-2.248, P=0.0461) and PAG (t=-2.492, P=0.029) showed significantly higher activity in BF compared with C (Figure 2). Figure 2: Relationships between ROIs and subjective feelings. Activity in the left CB, right posterior insula, and PAG were positively correlated with feeling “safe” (CB: t=2.380, P=0.026, adjusted R2=0.169; S-W statistic=0.949, P=0.255; D-W statistic=2.578; posterior insula: t=3.233, P=0.004, adjusted R2=0.291; S-W statistic=0.919, P=0.054; D-W statistic = 1.783), and “unpleasant” (PAG: t=2.825, P=0.010, adjusted R2=0.233; S-W statistic=0.972, P=0.720; D-W statistic=1.829) (Figure 3). Figure 3: Correlations between brain activity and subjective feelings. In contrast, activity in the right SI, RVM, mid-lateral OFC, and ACC was negatively correlated with feeling “unnatural” (SI: t=-3.726, P=0.001, adjusted R2=0.359; S-W statistic=0.935, P=0.126; D-W statistic=2.012; RVM: t=-2.214, P=0.037, adjusted R2=0.145; S-W statistic=0.950, P=0.272; D-W statistic=1.797), “unpleasant” (OFC: t=-2.835, P=0.010, adjusted R2=0.234; S-W statistic=0.924, P=0.070; D-W statistic=1.924), and “comfortable” (ACC: t=-2.395, P=0.026, adjusted R2=0.171; S-W statistic=0.954, P=0.329; D-W statistic=1.633) (Figure 3). We extracted two principal components: 1) brain activity associated with positive emotion (48.544% of the total variance); and 2) brain activity associated with negative emotion (21.902% of the total variance). A subsequent exploratory factor analysis including seven predictors for the ROI activity scores revealed that these predictors converged on two factors (Figure 4). The first (Factor 1) included activity in the SI, CB, posterior insula, mid-lateral OFC, and RVM. The second (Factor 2) included activity in the ACC and PAG (Table 1 and Figure 4). Table 1: Exploratory factor structure of brain activity. Figure 4: 2D scatter plot of principal components (PCs) of brain activity. The x-axis and the y-axis represent PC1 and PC2, respectively. We confirmed the sampling adequacy with Bartlett’s test of sphericity (χ2=89.556, df=21, P<0.0001) and KMO’s test (KMO measure=0.627). Moreover, the score for Factor 1 was negatively correlated with “unnatural” feelings (t=-2.870, P=0.009; adjusted R2=0.239; S-W statistic=0.982, P=0.936; D-W statistic=2.132). In addition, the score for Factor 2 was significantly positively correlated with “unpleasant” feelings (t=2.478, P=0.021; adjusted R2=0.183 S-W statistic =0.980, P=0.900; D-W statistic=1.366). Furthermore, there was a significant positive correlation between the score for simultaneous activation of the RVM and deactivation of the PAG (55.954% of the total variance) and right SI activity (t=4.361, P<0.0001, adjusted R2=0.439; S-W statistic=0.940, P=0.165; D-W statistic=2.705) (Figure 5). Figure 5: Significant positive correlation between the score for simultaneous activation of the RVM and deactivation of the PAG and right SI activity. Activity in the right SI was positively correlated with that in the left CB (t=2.199, P=0.040), RVM (t=2.783, P=0.012), and right posterior insula (t=2.561, P=0.019). In contrast, activity in the right SI was negatively correlated with that in the PAG (t=-2.709, P=0.014; adjusted R2=0.761; S-W statistic=0.393, P=0.393; D-W statistic=1.707) (Figure 6). Moreover, activity in the mid-lateral OFC was positively correlated with that in the RVM (t=5.327, P<0.0001), and negatively correlated with that in the PAG (t=-2.375, P=0.027; adjusted R =0.607; S-W statistic=0.742, P=0.742; D-W statistic=1.540) (Figure 6). Activity in the ACC was positively correlated with that in the PAG (t=2.581, P=0.017; adjusted R2=0.197; S-W statistic=0.928, P=0.088; D-W statistic=2.873) (Figure 6). Figure 6: Multi-regression analyses with the right SI, mid-lateral OFC, or ACC as the dependent variable. Each arrow represents the correlation, and the tail and the head represent an independent variable and the dependent variable, respectively. In the present study, participants reported that they felt more positive feelings when circularly rubbed on the back of the left hand compared with being rubbed back and forth on the same hand. In contrast, they reported that they felt more unnatural and nervous when rubbed back and forth compared with being circularly rubbed. Moreover, there was no significant difference in feelings of unpleasantness. As backand- forth linear movements have non-human and mechanical characteristics, they might make participants feel unnatural and nervous. In contrast, circular movements have human and affiliative characteristics, which might make participants experience positive feelings. Furthermore, in BF compared with C, there was significantly more activation in the ACC and PAG, but significantly less in the right SI and left CB. Furthermore, ACC activity was negatively correlated with “comfortable” feelings and PAG activity was positively correlated with “unpleasant” feelings. Meanwhile, right SI activity was negatively correlated with “unnatural” feelings and left CB activity was positively correlated with “safe” feelings. These results suggest that ACC and PAG activity is related to negative emotions associated with being rubbed, while right SI and left CB activity are related to the positive emotions evoked by rubbing. The ACC receives somatosensory information via the insula and OFC, which are both well connected with the ACC . ACC activation was observed to increase following a suggested increase in subjective unpleasantness, but to decrease following a suggested decrease in subjective unpleasantness . This indicates that the ACC is involved in representing affective qualities of a stimulus rather than its physical intensity. In fact, there was no significant difference in the perceived intensity between C and BF. Activity in the ACC is also positively correlated with unpleasantness of pain in healthy individuals , indicating that this region is particularly involved in affective responses to pain. Moreover, the ACC controls the brainstem, including the PAG and RVM [59,60] , during both opioid and placebo analgesia [39,61]. The ACC has one of the highest levels of opioid receptor binding in the cortex , and positron emission tomography (PET) studies indicate that the binding potential is specifically highest in the ACC [63,64]. The PAG plays a pivotal role in the DPMS . It is functionally connected with the ACC , and participates in the descending modulation of pain. Indeed, our results that ACC activity is positively correlated with PAG activity, which in turn was negatively correlated with right SI activity, suggests involvement of the DPMS. Moreover, the DPMS can function even in the absence of painful/stressful stimulation, because intrinsic functional connectivity among DPMS regions (including the ACC and RVM) has been demonstrated in such situations . Moreover, the DPMS is activated during self-touching behaviors in pain-free and stress-free situations . A positive correlation has been observed between behavioral opioid analgesia and opioid-induced suppression of neuronal responses to noxious stimuli in the RVM . The RVM plays a critical role in both inhibition and facilitation of pain through interactions with the spinal cord. Both off- and on-cells in the RVM project to the spinal dorsal horn, indicating that they exert modulatory influences on nociceptive/ non-nociceptive inputs . RVM on-cells are directly inhibited by opioids, and it is suggested that these cells express mu-opioid receptors . Moreover, increased RVM neuronal responses to noxious stimuli observed in human imaging studies indicate on-cell activity [69,70]. In fact, we observed a positive correlation between RVM activity and right SI activity in the present study. Furthermore, simultaneous activation of the RVM and deactivation of the PAG was positively correlated with right SI activity. This suggests that PAG activity inhibits on-cell activity in the RVM, which suppresses right SI activity. In fact, PAG neurons modulate nociception by directly inhibiting on-cells in the RVM via GABAergic neurons . Conversely, somatosensory afferent signals were enhanced (facilitated) by circular rubbing compared with back-and-forth rubbing. We suggest that the mid-lateral OFC downregulates PAG activity, which inhibits RVM activity and/ or directly upregulates RVM activity, based on reward/saliency evaluation processes in the midlateral OFC. This suggestion is supported by results indicating that mid-lateral OFC activity is negatively correlated with PAG activity, and positively correlated with RVM activity. Moreover, the mid-lateral OFC showed a negative correlation with “unpleasant” feelings. Furthermore, co-activation of the left midlateral OFC, CB, and RVM, and of the right SI and posterior insula showed high factor loading on Factor 1, which was negatively correlated with “unnatural” feelings. However, these co-activations showed low factor loading on Factor 2, which was positively correlated with “unpleasant” feelings. The posterior and mid-insula receive somatosensory information through projections from the SI [72,73] and directly from the thalamus . The OFC receives somatosensory information from the granular insula and directly from the SI [75-77]. As such, the OFC can mediate integration of such information and evaluate its rewarding (salient) characteristics. Indeed, a meta-analysis has suggested that sensory pleasure is most faithfully represented within a mid-lateral OFC site . Neuroimaging studies of placebo effects on physical pain suggest that activation of the ACC, OFC, and vmPFC influences pain by activating the descending pain regulatory pathways in the brainstem, especially opioidergic mechanisms in the PAG [39,45,79-83]. The DPMS is important for many forms of pro- and anti-nociception in non-human animals, paralleling involvement in human placebo and nocebo effects. The present findings show that somatosensory afferents to the SI are regulated by the DPMS under the control of the mid-lateral OFC and ACC, even under mild somatosensory stimulation situations. The principal component and regression analyses of brain activity and subjective feelings showed that somatosensory afferents to the primary somatosensory cortex contralateral to the rubbed hand were regulated by the descending pain modulatory system under the control of the mid-lateral orbitofrontal cortex and anterior cingulate cortex, even under mild (pain-free) rubbing situations. Rolls ET. Emotion Explained. Oxford University Press, Oxford (2005). Hertenstein MJ, Verkamp JM, Kerestes AM, et al. The communicative functions of touch in humans, nonhuman primates, and rats: a review and synthesis of the empirical research. Genet. Soc. Gen. Psychol. Monogr 132(1), 5-94 (2006). Feldman R, Singer M, Zagoory O. Touch attenuates infants’ physiological reactivity to stress. Dev. Sci 13(1), 271-278 (2010). Fairhurst MT, Löken L, Grossmann T. Physiological and behavioral responses reveal 9-month-old infants’ sensitivity to pleasant touch. Psychol. Sci 25(5), 1124-1131 (2014). Löken LS, Wessberg J, Morrison I, et al. Coding　of　pleasant　touch　by　unmyelinated　afferents　in　humans. Nat. Neurosci 12, 547-548 (2009). Morrison I, Loken LS, Olausson H. The skin as a social organ. Exp. Brain. Res 204(3): 305-314 (2010). Coan JA, Schaefer HS, Davidson RJ. Lending a hand: social regulation of the neural response to threat. Psychol. Sci 17(1), 1032-1039 (2006). Liljencrantz J, Ellingsen DM, Leknes S, et al. “C-tactile afferent stimulation modulate pain perception,” in Society for Neuroscience, New Orleans, LA. (2012). Mancini F, Nash T, Iannetti GD, et al. Pain relief by touch: a quantitative approach. Pain 155(1), 635-642 (2014). Mancini F, Beaumont AL, Hu L, et al. Touch inhibits subcortical and cortical nociceptive responses. Pain 156, 1936-1944 (2015). Dunbar RI. The social role of touch in humans and primates: behavioural function and neurobiological mechanisms. Neurosci. Biobehav. Rev 34(1), 260-268 (2010). Gallace A, Spence C. The science of interpersonal touch: an overview. Neurosci. Biobehav. Rev 34(1), 246-259 (2010). Morrison I, Löken LS, Olausson H. The skin as a social organ. Exp. Brain. Res 204(1), 305-314 (2010). Rolls ET. The affective and cognitive processing of touch, oral texture, and temperature in the brain. Neurosci. Biobehav. Rev 34(1), 237-245 (2010). Sherman KJ, Cherkin DC, Hawkes RJ, et al. Randomized trial of therapeutic massage for chronic neck pain. Clini. J. Pain 25(3) 233-238 (2009). Field T. Massage therapy. Med. Clin. Am 86(1), 163-171 (2002). Field T, Diego M, Hernandez-Reif M, et al. Insulin and insulin-like growth factor I (IGF-1) increase in preterm infants following massage therapy. J. Dev. Behav. Pediatr 29(6), 463-466 (2008). Field T, Diego M, Hernandez-Reif M. Preterm infant massage therapy research: a review. Infant. Behav. Dev 33(2), 115-124 (2010). Procianoy RS, Mendes EW, Silveira RC. Massage therapy improves neurodevelopment outcome at two years corrected age for very low birth weight infants. Early. Hum. Dev 86(1), 7-11 (2010). Hart S, Field T, Hernandez-Reif M, et al. Preschoolers’ cognitive performance improves following massage. Early. Child. Dev. Care 143(1), 59-64 (1998). Hou WH, Chiang P T, Hsu TY, et al. Treatment effects of massage therapy in depressed people: a meta-analysis. J. Clin. Psychiatry 71(7), 894-901 (2010). Russell NC, Sumler SS, Beinhorn CM, et al. Role of massage therapy in cancer care. J. Altern. Complement. Med 14(2), 209-214 (2008). Hughes D, Ladas E, Rooney D, et al. Massage therapy as a supportive care intervention for children with cancer. Oncol. Nurs. Forum 35(3), 431-442 (2008). Calenda E. Massage therapy for cancer pain. Curr. Pain. Headache. Rep 10(4), 270-274 (2006). Cronfalk BS, Strang P, Ternestedt BM. Inner power, physical strength and existential well-being in daily life: relatives' experiences of receiving soft tissue massage in palliative home care. J. Clin. Nurs 18(1), 2225-2233 (2009). Bergsten U, Petersson IF, Arvidsson B. Perception of tactile massage as a complement to other forms of pain relief in rheumatic disease. Musculoskeletal. Care 3(1), 157-167 (2005). Billhult A, Maatta S. Light pressure massage for patients with severe anxiety. Complement. Ther. Clin. Pract 15(1), 96-101 (2009). Goodfellow LM. The effects of therapeutic back massage on psychophysiologic variables and immune function in spouses of patients with cancer. Nurs. Res 52, 318-328 (2003). Olausson H, Cole J, Rylander K, et al. Functional role of unmyelinated tactile afferents in human hairy skin: sympathetic response and perceptual localization. Exp. Brain. Res 184, 135-140 (2008). Augustine JR. Circuitry and functional aspects of the insular lobe in primates including humans. Brain Res. Rev 22(3), 229-244 (1996). Craig AD. Interoception and emotion. In Handbook of Emotions, Third Edition, Lewis M, Haviland-Jones JM, Barrett LF eds. 272-288, Guilford Publications, NY (2008). Gordon I, Voos A C, Bennett RH, et al. Brain mechanisms for processing affective touch. Hum. Brain. Mapp 34, 914-922 (2013). Ackerley R, Backlund Wasling H, Liljencrantz J, et al. Human C-tactile afferents are tuned to the temperature of a skin-stroking caress. J. Neurosci 34, 2879-2883 (2014). Ellingsen DM, Wessberg J, Eikemo M, et al. Placebo improves pleasure and pain through opposite modulation of sensory processing. Proceedings of the National Academy of Sciences of the United States of America 110(44), 17993-17998 (2013). Amanzio M, Benedetti F, Porro CA, et al. Activation likelihood estimation meta-analysis of brain correlates of placebo analgesia in human experimental pain. Hum. Brain. Mapp 34(3), 738-752 (2013). Eippert F, Bingel U, Schoell ED, et al. Activation of the opioidergic descending pain control system underlies placebo analgesia. Neuron 63(4), 533-543 (2009). Lu HC, Hsieh JC, Lu CL et al. Neuronal correlates in the modulation of placebo analgesia in experimentally-induced esophageal pain: A 3T-fMRI study. Pain 148(1), 75-83 (2010). Watkins LR, Mayer DJ. Organization of endogenous opiate and non-opiate pain control systems. Science 216, 1185-1192 (1982). Wager TD, Atlas LY. The neuroscience of placebo effects: connecting context, learning and health. Nat. Rev. Neurosci 16, 403-418 (2015). Atlas LY, Whittington RA, Lindquist MA, et al. Dissociable influences of opiates and expectations on pain. J. Neurosci 32, 8053-8064 (2012). Wiech, K. Lin CS, Brodersen KH et al. Anterior insula integrates information about salience into perceptual decisions about pain. J. Neurosci 30, 16324-16331 (2010). Lee HF, Hsieh JC, Lu CL, et al. Enhanced affect/cognition-related brain responses during visceral placebo analgesia in irritable bowel syndrome patients. Pain 153, 1301-1310 (2012). Atlas LY, Bolger N, Lindquist MA, et al. Brain mediators of predictive cue effects on perceived pain. J. Neurosci 30, 12964-12977 (2010). Kong J, Jensen K, Loiotile R, et al. Functional connectivity of the frontoparietal network predicts cognitive modulation of pain. Pain 154, 459-467 (2013). Petrovic P, Kalso E, Petersson KM, et al. Placebo and opioid analgesia — imaging a shared neuronal network. Science 295, 1737-1740 (2002). Kong J, Tu PC, Zyloney C, et al. 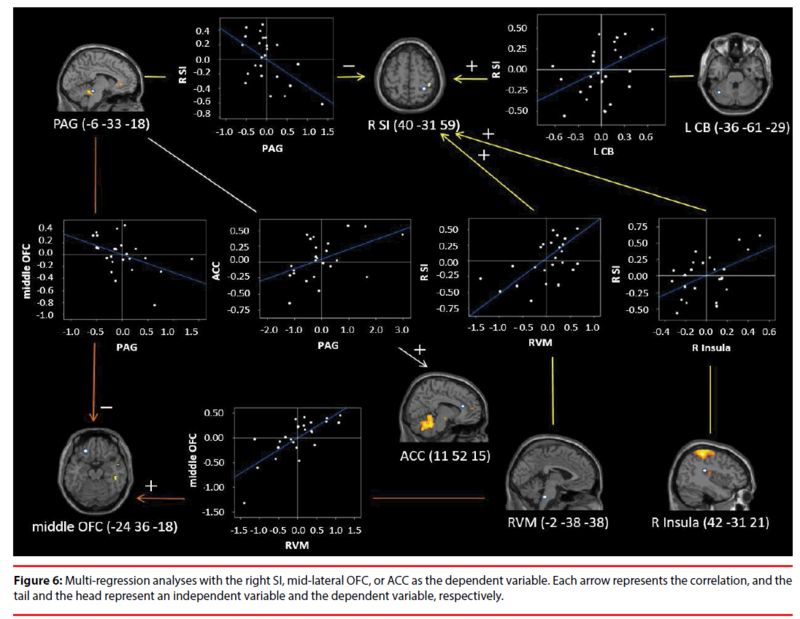 Intrinsic functional connectivity of the periaqueductal gray, a resting fMRI study. Behav. Brain. Res 211(2), 215-219 (2010). Kikuchi Y, Shirato M, Machida A, et al. The neural basis of self-touch in a pain-free situation. Neuropsychiatry (London) 8(1), 186-196 (2018). Olausson H, Wessberg J, Morrison I, et al. The neurophysiology of unmyelinated tactile afferents. Neurosci. Biobehav. Rev 34 (2), 185-191 (2010). Löken LS, Wessberg J, Morrison I, et al. Coding of pleasant touch by unmyelinated afferents in humans, Nat. Neurosci 12 (5), 547-548 (2009). Croy A, Luong C, Triscoli E, et al. Interpersonal stroking touch is targeted to C tactile afferent activation, Behav. Brain. Res 297, 37-40 (2016). Ackerley R, Hassan E, Curran A, et al. An fMRI study on cortical responses during active self-touch and passive touch from others. Front. Behav. Neurosci 6:51 (2012). Gordon I, Voos AC, Bennett RH, et al. Brain mechanisms for processing affective touch. Hum. Brain. Mapp 34, 914-922 (2013). Hardin MG, Pine DS, Ernst M. The influence of context valence in the neural coding of monetary outcomes. Neuroimage 48, 249-257 (2009). Zeidan F, Grant JA, Brown BA, et al. Mindfulness meditation-related pain relief: evidence for unique brain mechanisms in the regulation of pain. Neurosci. Letters 520, 165-173 (2012). Wiech K, Edwards R, Moseley GL, et al. Dissociable neural mechanisms underlying the modulation of pain and anxiety? an fMRI pilot study. PLOS. ONE 9(12) (2014). Van Hoesen GW, Morecraft RJ, Vogt BA. Connections of the monkey cingulate cortex. In: The neurobiology of the cingulate cortex and limbic thalamus: a comprehensive handbook, Vogt BA, Gabriel M eds, 249-284 Birkhäuser, Boston, MA (1993). Rolls ET, O'Doherty J, Kringelbach ML, et al. Representations of pleasant and painful touch in the human orbitofrontal and cingulate cortices. Cereb. Cortex 13(3), 308-317 (2003). Brown CA, Jones AK. Meditation experience predicts less negative appraisal of pain: electrophysiological evidence for the involvement of anticipatory neural response. Pain 150, 428-438 (2010). Fields H. State-dependent opioid control of pain. Nat. Rev. Neurosci 5(7), 565-575 (2004). Petrovic P. Opioid and placebo analgesia share the same network. Semin. Pain. Med 3(1), 31-36 (2005). Zubieta JK, Ketter TA, Bueller JA, et al. Regulation of human affective responses by anterior cingulate and limbic mu-opioid neurotransmission. Arch. Gen. Psychiatry 60(11), 1145-1153 (2003). Vogt BA, Wiley RG, Jensen EL. Localization of Mu and delta opioid receptors to anterior cingulate afferents and projection neurons and input/output model of Mu regulation. Exp. Neurol 135(2), 83-92 (1995). Jones AK, Qi LY, Fujirawa T, et al. In vivo distribution of opioid receptors in man in relation to the cortical projections of the medial and lateral pain systems measured with positron emission tomography. Neurosci. Lett 126(1), 25-28 (1991). Willoch F, Schindler F, Wester HJ, et al. Central poststroke pain and reduced opioid receptor binding within pain processing circuitries: a [11C] diprenorphine PET study. Pain 108(3), 213-220 (2004). Basbaum AI, Fields HL. Endgnous pain control systems: brainstem spinal pathways, and endorphin circuitry. Annu. Rev. Neurosci 7, 309-338 (1984). Hopkins E, Spinella M, Pavlovic ZW, et al. Alterations in swim stress-induced analgesia and hypothermia following serotonergic or NMDA antagonists in the rostral ventromedial medulla of rats. Physiol. Behav 64(3), 219-225 (1998). Fields HL, Malick A, Burstein R. Dorsal horn projection targets of ON and OFF cells in the rostral ventromedial medulla. J. Neurophysiol 74(4), 1742-1759 (1995). Heinricher MM, Morgan MM, Fields HL. Direct and indirect actions of morphine on medullary neurons that modulate nociception. Neuroscience 48(3), 533-543 (1992). Dunckley P, Wise RG, Fairhurst M, et al. A comparison of visceral and somatic pain processing in the human brainstem using functional magnetic resonance imaging. J. Neurosci 25(32), 7333-7341 (2005). Gwilym SE, Keltner JR, Warnaby CE, et al. Psychophysical and functional imaging evidence supporting the presence of central sensitization in a cohort of osteoarthritis. Arthritis. Rheum 61(9), 1226-1234 (2009). Morgan MM, Whittier KL, Hegarty DM, et al. Periaqueductal Gray neurons project to spinally projecting GABAergic neurons in the rostral ventromedial medulla. Pain 140(2), (2008). Mufson EJ, Mesulam MM. Insula of the old world monkey: II: afferent cortical input and comments on the claustrum. J. Comp. Neurol 212, 23-37 (1982). Friedman DP, Murray EA, O’Neill JB, et al. Cortical connections of the somatosensory fields of the lateral sulcus of macaques: evidence for a corticolimbic pathway for touch. J. Comp. Neurol 252, 23-347 (1986). Craig AD, Bushnell MC, Zhang ET, et al. A thalamic nucleus specific for pain and temperature sensation. Nature 372, 770-773 (1994). Barbas H. Anatomic organization of basoventral and mediodorsal visual recipient prefrontal regions in the rhesus monkey. J. Comp. Neurol 276, 313-342 (1988). Morecraft RJ, Geula C, Mesulam MM. Cytoarchitecture and neural afferents of orbitofrontal cortex in the brain of the monkey. J. Comp. Neurol 232, 341-358 (1992). Carmichael ST, Price JL. Sensory and premotor connections of the orbital and medial prefrontal cortex of macaque monkeys. J. Comp. Neurol 363, 642-664 (1995). Kringelbach ML, Rolls ET. The functional neuroanatomy of the human orbitofrontal cortex: evidence from neuroimaging and neuropsychology. Prog. Neurobiol 72, 341-372 (2004). Vogt BA, Sikes RW, Vogt LJ. Anterior cingulate cortex and the medial pain system. In: Neurobiology of cingulate cortex and limbic thalamus, 313-344, Springer, NY (1993). Benedetti F, Arduino C, Amanzio M. Somatotopic activation of opioid systems by target-directed expectations of analgesia. J. Neurosci 19, 3639-3648 (1999). Bingel U, Schoell E, Büchel C. Imaging pain modulation in health and disease. Curr. Opin. Neurol 20, 424-431 (2007). Scott DJ, Stohler CS, Egnatuk CM, et al. Placebo and nocebo effects are defined by opposite opioid and dopaminergic responses. Arch. Gen. Psychiatry 65, 220 -231 (2008). Eippert F, Bingel U, Schoell ED, et al. Activation of the opioidergic descending pain control system underlies placebo analgesia. Neuron 63, 533-543 (2009).